on MetroPlus Weekend dated today. All thanks to Sudhish Kamath for such a wonderful interview. And his bosses who thought I was worthwhile to be written about.And here it is. No you are the one and only one eligible single girl in the country with multiple interests i think. gone through your interview 2day..!gr8! I could describe you as an all-rounder...! Kudos to all your activities! Our ( myself and my wife )best wishes to you. I read the article about you and got the address of your blog from there. You are really talented and I expect to hear more from you through newspapers in the future. yaar ivan Satya? so desperate... lol.. anyways, nice blaag lady.. sooper.. Amar chitra Katha Uncle Pai patthi ezhuthi romba feelings aakkitteenga... :)and, nice interview... you never 'sucked' with RJing.. you were better than many others.. :) great that you loathe maths and love to write letters.. me too.. best regards.. Ram, Auto-Journalist..
Thats a great stuff to browse through your interview. Kudos and all the best for future works. Dear chinmayi, i never follow the guys who are from film industry. Certainly its because i don’t think they are special people. they have earned money through cine profession like other peoples. but 1st time in my life I have interested with u due to ur various role in society. All the best. Good Chinmaya . Keep it up your good works. Your mom is really great. Regards to both you and mom. What is she doing . Is she housewife ? I am a grate fan of you from the day I listened your first song, that was way back (January 12, 2002). On that day "Kannathil Mutthamittal" Music Album was released. I bought a cassette of the album and pick of the album was yours. Still I am very surprises when I am listening to the song. Because how a debutant singer gave that much amount of feel to a wonderful song. From that day You always rocking with your performance on various fields. That was a nice read! great interview and Here's wishing you more successful (ad)ventures! nice interview. Shows the way how a girl child should be bought up in life. Will certainly try the best with mine. All kudos to your great mom. உங்கள் நேர்காணலை படித்தேன். மனம் நிறைவாக இருந்தது. படித்ததும் எத்தனை பேருக்கு இப்படி உண்மையாய் பேச துணிவிருக்கிறது என்று யோசித்தேன். வளர்ந்ததும் அறிமுகப்படுத்தியவர்கள் மற்றும் வளர்ச்சிக்கு உதவியவர்களை உதரிசெல்பவர்கள் தான் அதிகம். உங்கள் நேர்காணல் ஒளிவு மறைவற்று உற்சாகமாகவும் உண்மையாகவும் இருந்தது. உங்கள் மனதில் தோன்றியதை எதைப்பற்றியும் கவலைப்படாமல் வெளிப்படையாக பேசிய நேர்மை என்னை மிகவும் கவர்ந்தது. உங்கள் வலைப்பக்கமும் எழுத்திலும் உங்கள் திறன் குறைந்தது அல்ல என்பதையே காட்டுகிறது. நான் எதையும் மிகைப்படுத்தி கூறவில்லை. வாழ்வில் எல்லாவற்றிலும் வெற்றியை ருசித்து இன்புற்று வாழ என் நெஞ்சார்ந்த வாழ்த்துக்கள். 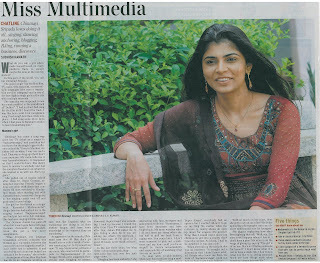 Hi Chinmayee,nice to read about you in Hindu.I used to hear the name in fm and had not any idea about you then. "chinmayee" is a catchy name and it touches the soul when we sound it. I advocated of giving my new born baby girl the same name,but failed to succeed.At last we ended up with the name "Niyatee". All the best for all your endeavour. Bot where is Chinmayi the VJ today? someone told me ,one of my school mates was ur friend, and she still my orkut friend. I used to brag to ppl that,chinmayee is friend's friend. I thot u were a lil supercilious initially, but the article in Hindu jus chnged my perspective. I was very much impressed by the way , ur learning German(very unconventional in India)...helped with B Elephant. nice reading your blog. a multi talented gal ever i know.saw yr interview this morning and glad to note that u r also a blogger and interested in foodie things. My hubby used to talk freequently with u on yr coppy club aha fm. visit my blog in yr free time dear. gr8 ya..how much ever modern ways of communication comes..letters are always precious ...reading a letter from ur dear ones after yrs always gives a smile in ur face...Happy to know that u r being one such reason to ur dear ones.. I am impressed. You are very talented Chinmayi. May God bless you. It was nice article. Five things you didn’t know about me was really interesting. read ur interview ..astonished to see if ppl can do multi tasks as u do..keep up..go ahead.. I ve been an ardent follower of your songs, blog and shows in Vijay TV. You are a perfect example to the phrase - multifaceted personality. Singer, voice over artist, translator, blogger, RJ, TV Show host and a Dancer. You ve made a name for yourself in all that you ve done. My best wishes for all your future endeavors. May god bless you with a long life and good health. Though I been to your blogs on and off, I thought today I need to comment on the Hindu article..
"I once jumped off a terrace to prove that girls can do pretty much what boys can."" Having reading and commenting on your blogs for sometime I am not at all surprised.Lol! All the very best to Amma! !Cheer up Madam!! Let your wishes come true soon. An inspiration to the rest. Your arduous journey has paid off well and the recognition is inevitable. I hope you make your mom and yourself happy by finding the right guy too amidst all your achievements. anyway awesome interview..!! i read the whole thing..!! m actually very interested to know more about "blue elephant"...!! which skool did u study in ????? i heard u r from hindu sr indra nagar i am fro mthat skoool !!!!! hope u would reply !!!!! Hi there..its first time i've ever read about your interview..Just very recently I read about you in wikipedia,and thats how I became to know about your blog and ever since I became a regular visitor to your blog. Before this I only know you as a singer,of course I was already great fan of yours from your first song,now I adore you for who you are..I like your enthusiasm and passion for life..Its very infectious..
Way to go lady..:)..all the best.. I had been going thro' your blog and watching your TV shows for past couple of months. I have become a fan of yours. You are doing great and wish you to continue in future. Convey my regards to your mom. You are sure to be inspiration and role model all the present/future aspiring young talent. Actually i happened to see the paper today wit ur photo and just read it..its was really nice..multitasking..really inspirational..
i'm a g8 fan of urs! why is it that u dont compire in super singer anymore? But i wanted to be like you, great winner in multiple fields, but unfortunately i cant.. dont know the reasons. But seeing you, i feel v.happy. Thalavi kalakitenga...It was nice Interview.And in an weekly magazine i saw u r from paramakudi is it true? bcos my native is also paramakudi...keep rocking thalavi..
the pictures could have been much better. you sure look way more gracious than them. While reading your Interview on the Hindu, i realized something... you seem to moderate criticism about the shows or anything you host, but Why is it that positive things are allowed while negative things arent. When some one says Good or positive about something happening it seems to get accepted but Negative things arent!! I am thinking your blog should be a place where you accept both (done in a decent way) or reject both ! You cant be partial to good ! I love You! Keep up the great work....So happy to see this article! 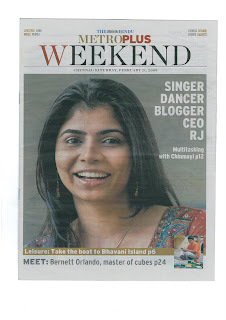 Surprise to see you in the Hindu MetroPlus Weekends & read the article about your successful works along with your career. Keep going with same spirit. All the very best Chini. I am proud that I am one of your fan to your voice and Now I am proud of reading your successful article that your carry on. I read the interview and it was excellent. I hope I am the first person here to wish ARRahman for his tremendous win of 2 Prestigious Oscars. Hey Chinmayi, That was soooper dooper interview!! Always admire you for the optimising you spread! got to know a lot about your through your blogs!! Such a versatile artist!! Good luck lady!! Keep going! I am very happy that you followed your wishes and turned successful!! Spl thanks to your mom ;-) for taking you the right way! and hey... a frnd of mine bugging me with "I think there is a fight between vijay tv and chinmayi". this started when you were missin in the list of singers wishin ARR in the ARR spl... and again when u went missin in the list of singers in yella pughayum oruvan oruvanuke..
Hey Chinmayi our own ARR won 2 oscars.. saw it live? I'm ahead by 2.30 hrs from IST.. so caught it live here in SG... Awesome!!!! Ajay Kumar: well, its the act of a single producer. Why blame the channel? I do not hold the channel responsible for an employee's act. And I didn't need to be part of that show to say what the tremendous gratitude and respect I have for Rahman sir as a Guru. Loved it! Nice interview, and nice pic. But Chinmayi, We wud like to see you as a VJ, somewhere sometime. you conduct with the visual expression of "Poise". We miss you as a VJ. I have been a listener to ur voice since nejil jil jil to till date. Happy to see ur developments as a singer and as as individual. Now today you shall be proud to be a part of Music Genius and Oscar Winner ARRahman's team of Playback singers. Hope he gives u too a chance to sing in a foreign film. That was a splendid article,the pictures -even better. I have been following ur blog for quite a while now,but this is my very first comment. You are doing some amazing work,keep that going.It is beautiful to see that wonderful relationship between you and ur mum. Keep singing,keep smiling,keep shining bright,and stay inspired forever! Read ur article on hindu and it was simply superb. Came to know of this blog from that article. Many congrats to u on being a multi facted personality that u are. My best wishes to u to continue being the person u are. I simply admire the fact that u are so simple and yet so strong.. Good going!!! Great.I Like your Blog. Good. I saw your Interview In Hindu.Best Of Luck da. Keep it Up. God Bless you. Are you practising to be an ashtavadhani? Great! You are a femme fatale indeed. That was a cool interview. I have always admired you not only as a singer but also as a young girl who tries everything that comes up to her. You're one person who can be a role model for so many girls outside there. Keep rocking! All the best! Congratulations! You deserve all the recognition that comes your way. your deserving it chinmayi.Keep it up ,all the very best for ur future. god bless you. Srikrishnan: Any valid personal remark will be well taken for self improvement. This is a blog. Not a forum for discussing rights and wrongs. AjayKumar: This is called the typical vambu. Anyway chinmayi has answered it. Best wishes to you now & always Chinmayi! Great to read the article & GORGEOUS pictures! Take care, & miss you on Airtel Super Singer. It's just not the same without you! Keep smiling & singing! You look a lot more gorgeous on your profile pic than on The Hindu. Felt very nice reading your article. Congratulations...!! You are blessed with a wonderful life filled with opportunities and ofcourse an open mind to accept them all and give it your best shot. Good luck with everything that you do. Great smile in tat pic.. keep rocking. You got lots of fans here @ Puerto Rico. Though it was short it had all the essence of your ongoing activities. Photos could have been a little better tho'. It was surprising to know bt the other side(s) of Chinmayi,the singer.. All these days, i was of the impression dat u r a playback singer with additional role of hosting the supersinger show.. But after reading the article, i was quite impressed.. Best wishes for your future endeavours..
hi..chin im ur great fan..
late comment though. Am a great fan of yours and have been following (!) you ever since you sang in Sapthaswarangal.. I still remember, it is 'thesulaavudhe thaen malaraale' you sang in Sapthaswarangal...way to go! Best wishes for all your endeavors. 'Chinmayee must be a relative of someone from media, and hence got a chance to sing for Rahman in 'kannathil muthamital' and to host a show in Vijay TV'. This was my thought in those days, watching you in TV shows. As the days pass, then and there u proved me wrong with your exceptional multitasking talents. 'What a maturity this girl has shown as the days goes by, the elegance and poise u carry', great improvements. And after reading the article I am stumped. As all know u as a versatile singer but u run a translation company, I know how tough it is, classical dancer (superb), blogger!, who being a girl has guts to blog?, your way of reaching your fans as u justified, a girl who knows psychology, RJ and so on. U must have had something in u really, in younger days. Kudos to your mother, a clever lady knowing how to bring up a girl. Hey girl, U is living as a girl needed for this culture. I rarely comment on blogs, because I don’t get attracted soon, u made me, after reading the article, you’re worthwhile to commented. All the best! Hai i am great fan of urs......been surprised on ur involvements in lot of fields and ur sucess in it...great...keep it up.. I was pasted your photograph(metro plus-first page) in my study room.. You have some rocking stuff.. keep rocking..
You are one of the role for us..
Its long way to go... keep going..